Folks who were visiting Disney’s California Adventure (DCA) today were in for a bit of a treat because of a surprise appearance by cast members from Avengers: Endgame. 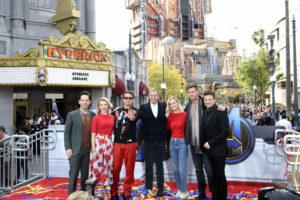 Robert Downey Jr. (Tony Stark, Iron Man), Chris Hemsworth (Thor), Brie Larson (Captain Marvel), Scarlett Johansson (Natasha Romanov, Black Widow), Jeremy Renner (Clint Barton, Hawkeye), and Paul Rudd (Scott Lang, Ant-Man) were all on hand along with Disney CEO Bob Iger to launch a new charity initiative, Avengers Universe Unites. Disney has long been known for its philanthropic work, giving largely to children’s charities around the world. Today’s launch supports Disney Team of Heroes, delivering inspiration and comfort to seriously ill children. Today’s event featuring the Avengers: Endgame stars was to celebrate a $5 million donation through Disney Team of Heroes to various nonprofits supporting critically ill children, including a $1 million cash donation to the Starlight Children’s Foundation. The bulk of the remaining $4 million donation was made by partners The Lego Group, Amazon, Funko, and Hasbro in the guise of Avengers: Endgame toys. The Avengers: Endgame stars were joined by children from the local chapter of the Boys and Girls Club. Check out photos from the event below, courtesy of Getty Images. Avengers: Endgame is in theatres April 26th.